Welcome to COSMIC MADNESS 2018 HEADQUARTERS! 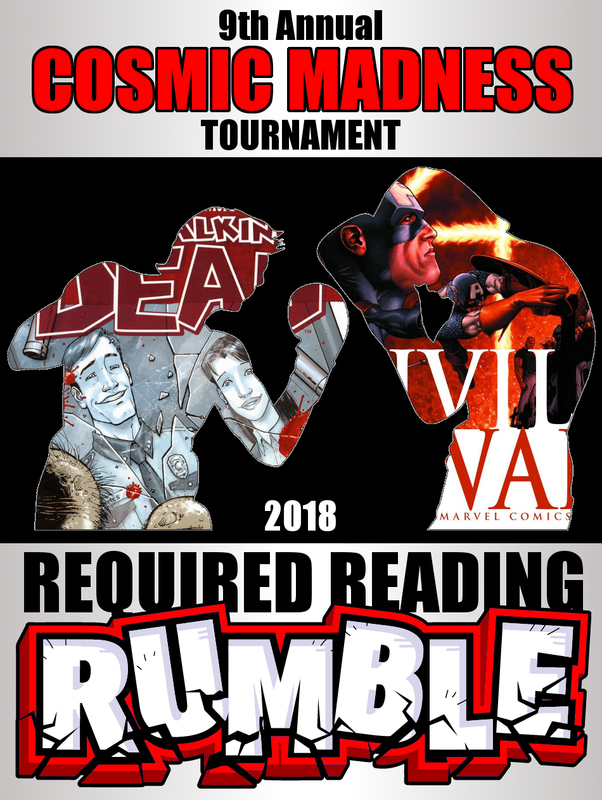 Sadly, the Cosmic Madness 2018 Tournament and Bracket Contest are now over, but feel free to read through to see what it was all about, which 'Required Reading' title was ultimately victorious and who won the Bracket Contest! This is your home for all updates regarding this year’s March Madness-esque tournament & contest -- our ninth annual Cosmic Madness! -- which we have dubbed the REQUIRED READING RUMBLE! "What is the BEST 'required reading' comic book of all-time?" But what exactly is 'required reading'? In short, it's all the comic books that are generally considered the greats, the must-reads, the prize winners, the fan favorites, and the ones that other people always make you feel guilty about never having read. Of course that must have you wondering... who are the contenders and what are the match-ups? Well, for that you can check out THE BRACKET section below! But also, Rusty has been recording and posting videos for weeks and we've been posting them right here at Cosmic Madness HQ and on YouTube! Check 'em out at the bottom of the page! Put together, they create ONE AMAZING COSMIC MADNESS MOVIE! Here's the bracket with all the contenders of Cosmic Madness 2018! Plus, from Wednesday, February 2 - Tuesday, March 13, you have a chance to fill out a tournament bracket with the Required Reading comics you think will win the tournament. It's the COSMIC MADNESS BRACKET CONTEST! 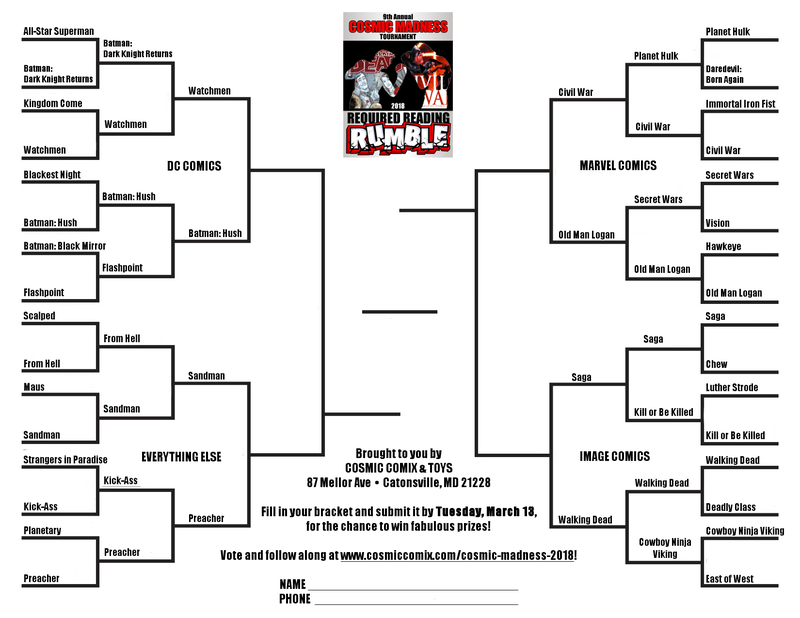 Print one out or pick one up at the store... pick the comics you think will win each match-up... turn in your sheet here at Cosmic Comix... and best of luck to all! A total of 15 people picked Saga as tournament champion! KEEP YOUR EYES HERE AS THE ROUNDS PROGRESS! The three people who predict the most correct winners... WIN PRIZES! And the scoring system is simple: 2 points for a correct First Round prediction, 3 points for a correct Sweet 16 prediction, 4 points for a correct Elite 8 prediction, 5 points for a correct Final Four prediction, and 6 points for picking the Championship Game winner! Highest point total wins! In the event of a tie, the tiebreaker is correct number of picks in the First Round. With a score of 115 points out of a possible 120, Jay missed only one pick in the entire tournament! This victory is well deserved, my friends. Jay, you have won $100 in Cosmic Cash!! Come on down to claim your winnings! Ken earned 109 points for his bracket and came in a close second to Jay. Of course, if Saga had beaten the Walking Dead this would be a different story. In any event... Ken, come on by to pick out four free TPBs! Will was only two points behind Ken, with another superb bracket. From what I can tell, Hush made deeper run than you anticipated. Be that as it may, you have won two free TPBs! 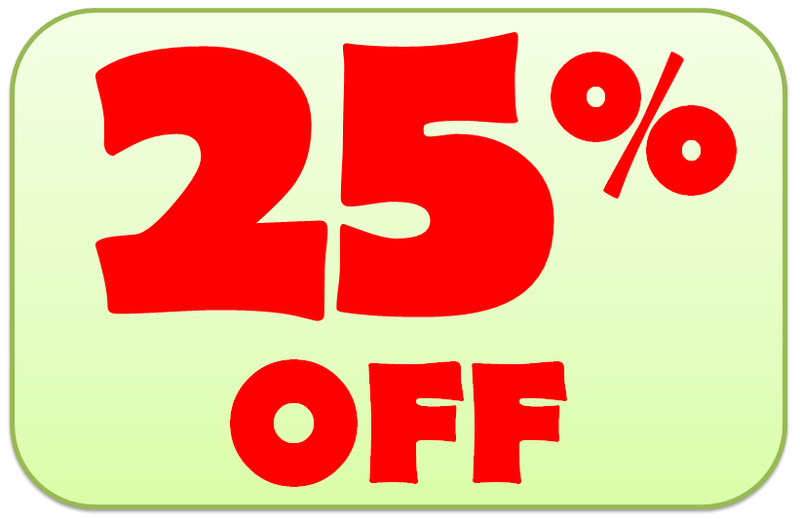 Plus, because we are calling these titles 'Required Reading' and we want you to read them, for the duration of the Cosmic Madness Tournament -- from now until Monday, April 2 -- all contending titles will be 25% OFF! Civil War! From Hell! Maus! Flashpoint! Scalped! Walking Dead! Old Man Logan! Watchmen! Dark Knight Returns! EVERY TITLE IN THE TOURNAMENT!! It's the perfect excuse to pick some of those books that you've been wanting to read forever! As we mentioned above, Rusty recorded videos explaining the picks for each and every region of the tournament: DC Comics, Marvel Comics, Image Comics, and Everything Else. Put together they make for ONE AMAZING MOVIE! Don't know who to vote for? Watch the videos! Don't know what to read? Watch the videos! Want to see Rusty hamming it up? WATCH THE VIDEOS! !